Politics is becoming interesting as the election nears and the horses come out to line up for the race. One interesting electorate to watch this election is the Aitape-Lumi district of West Sepik Province. It is arguably one of the most important provinces as it covers Papua New Guinea's territorial land border with Indonesia. 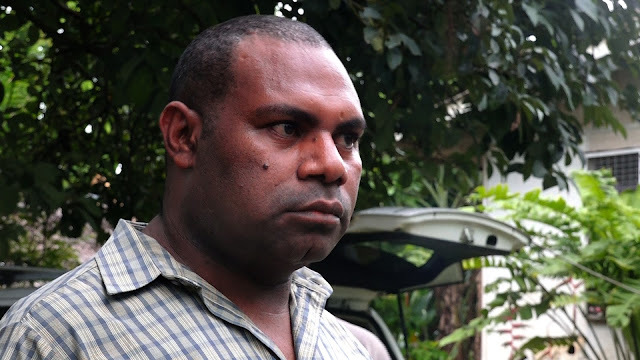 A total of 20 candidates have filled in the Form 29 to contest the Aitape-Lumi seat currently held by Treasury Minister and National Alliance Party Leader Patrick Pruaitch. Twelve of these candidates are from Aitape, while the other eight are from Lumi. For over 40-years infrastructures and basic services have deteriorated, main highways have become waterways and bridges have collapse. There is little hope that the rural population pray to survive the test of times as Christians would say. The Catholic Church runs most of the schools and health facilities and the people live off the land to pay for school fees and other expenses. These 19 candidates have one basic aim, that is change Pruaitch's 15-years leadership. I met up with one of Lumi's finest son who is contesting this election. He is one prominent lawyer who runs a private law firm in Lae city. Meet Emmanuel Toku Mambei, a young man from Karaitem village, Ward 8 of the West Wapei LLG in Lumi West Sepik. Mambei is an outspoken lawyer, who has a short but successful law career that he has served in both public and private practice. He is one man whom I've met in my capacity as a journalist in mainstream media as a reliable contact and a straight shooter. "Ive made up my mind to contest the elections because of the suffering my people have endured over the last 20-years or so," Mambei told me after one of his visits to his village in 2016. "The roads have become impassable and basic services are lacking at the LLG level, there is simply nothing to empower our local people." Emmanuel Mambei's dad was a former politician. Paul Mambei served the people of Aitape-Lumi from 1990-1997 when he lost to Eddie Saweni. Saweni served for a term before being ousted by Pruaitch in the 2012 National General Election. "There are a lot economic opportunities for the local people, but the depilated state of basic infrastructures and the gross neglect on improving basic services has deprived people's empowerment," Mambei said. Going up against Pruaitch won't be an easy task for Mambei and his counterparts. Pruaitch has been in the government for 15-years and has the backing of one of PNG's oldest political parties, the National Alliance Party. While West Sepik is a NA stronghold having it's candidates winning elections, Mambei sets up his winning strategy with the Peoples Progress Party (PPP) one of the founding political parties in the country. Whatever results comes out after the elections will determine the future of the people of Aitape-Lumi. The challenge is now on, will they vote for money and food or quality leadership? This is the Sepik Coastal Highway, which runs from Wewak to Aitape. This particular section of the road is at Paup in Aitape.